In Making Master Guitars, I used Mahogany or Spanish Cedar (Cedrela) for the neck – this being a commonly used species for many classical guitars. But now my preferred wood for the neck is walnut. It is harder and more dense than Cedrela and I like the beautiful patina you can achieve after polishing it. Most important though, is the hardness that makes it more effective at preventing energy absorption. Where the head veneer meets the nut, a perfect right angle slot between the head veneer and the fretboard is needed, to hold the nut in place. Luthier Tony Johnson showed me his method (which differs from the one shown in my book). His is a better way of making sure the angle is correct before even gluing the head veneer on to the head. 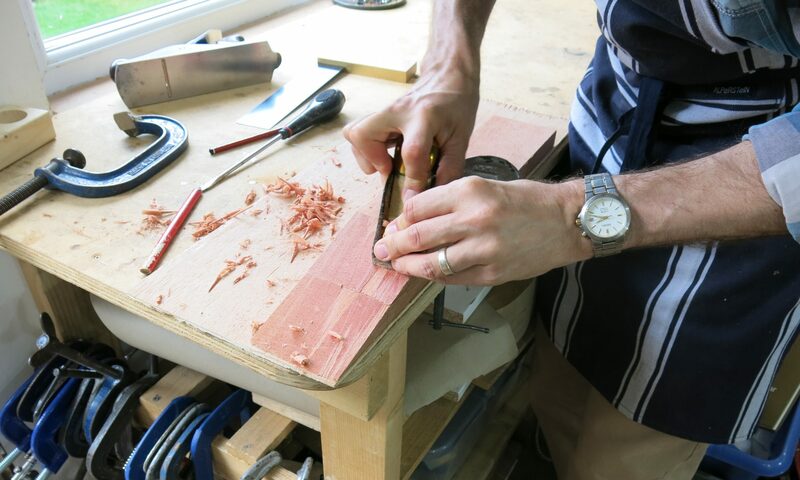 What you do is place the head veneer on the head and project it a little way over the neck, so you can use a block plane on its side, laid on the neck, to plane the angle which will then be square to the neck. To glue on the head veneer, you clamp a stop (I use a small engineer’s square) on to the neck, exactly at the change of angle between neck and head, and another stop at the far end, so the head veneer cannot move while being glued and clamped. This avoids the need to cut the end of the head veneer later, when there is a danger of cutting into the neck surface. Most tuning machines have 10mm rollers at 35mm centres. If the roller holes are drilled with a 10.5mm drill (or slightly smaller), a good fit will be achieved without the rollers binding. If they need cleaning out or reaming slightly larger, a drill bit held in a chuck can be used to fit them accurately. When I studied with Richard Schneider in 1983, he was using wedges to attach the sides to the neck. He learned it from Juan Pimentel back in the 1960s. The difference is that he used spruce wedges. That is interesting. But it seems more logical to use the same wood as the neck is made from. The wedge is simply a means of getting the rib securely into the groove. What is the virtue in using a softer species. I would have thought that the wedge should have it’s grain running in the same direction as the heel. Somewhat harder to cut and it would need to o in sideways rather lengthways but would be less prone to differential movement issues. You may theoretically be right but I don’t know anyone doing that. Actual fitting it would not be easy. I’ve never noticed any movement issues. It is common in cabinetmaking to have one section joined to another with different grain directions. Can you make an approach for guitars with elevated fingerboard? I have not made raised fingerboards. But I have made thick fingerboards about 8mm thick which is a little like a raised fingerboard.